This artifact stands unique as a perfect star map showing an ancient alien human arrival from the stars. It is mind blowing evidence when you sit back and realise what you are looking at. This Sumerian clay tablet is over 2500 years old and on record in public display listed as reference VAT 7851 and is located in the Museum of Ancient Near East in Berlin. A complete message is encoded and I will explain it here. 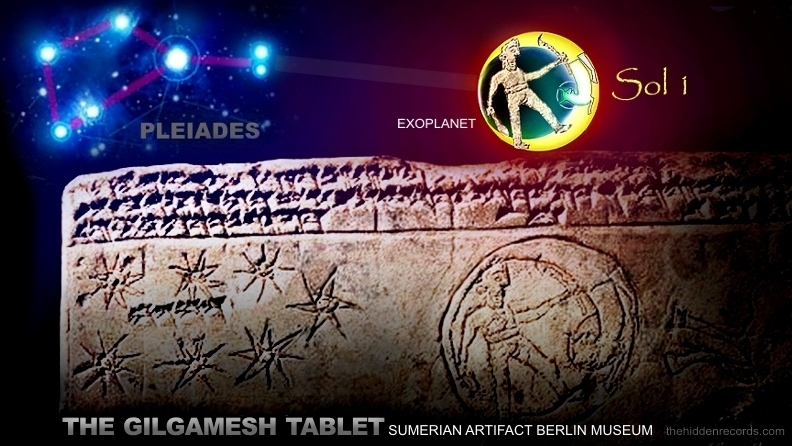 The depiction here is of what can only be described as an obsession with a sun and its exoplanet to one side of the stars of the Pleiades, the most important sun-like star associated with the deity Gilgamesh. Yes we are witnessing a star map BUT with an alien planet in crescent... or in dual representation as a flying celestial ship disc carrying a flesh and blood human venerated as a 'god'. The clay tablet depicts what scholars conclude as the Pleiades stars. The creator of this particular artifact has shown remarkable detail and realism compared to any other artifact. But here is where the scholars’ comments end. The being they say is Gilgamesh as a god as Orion but I propose conclusively as you will see, he is portrayed in dual representation with his world and his celestial ship. But his ship is uniquely encoded in a new teaching mechanism breaking away from the comon traditional birds wings and disc to show it is flying. He is also shown not wearing typical Sumerian attire in comparison to those in the scroll seals that follow. 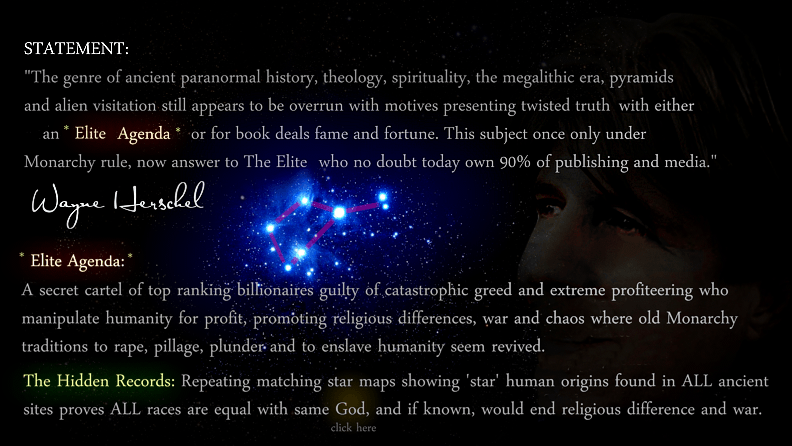 Is the 'god' traversing the heavens like a star traveller or is he trying to pictographically speak his ultimate secret? Let us refer from here forward to the entity in the artifact as Gilgamesh agreeing with scholars ref as you are about to find out he is also personification of both humanity as a human blueprint code ref as well as the stars of Orion ref that show the way to locate its position in the heavens. Gilgamesh is wearing a body suit with legs not covered with usual Sumerian robe. He wares an obvious belt because it is Orion's Belt. This is important in his identity. He is not bearded and even looks more Roman in appearance cleanly shaven and short military style haircut. The being has one hand on what looks like a club, but it could also be a lever. 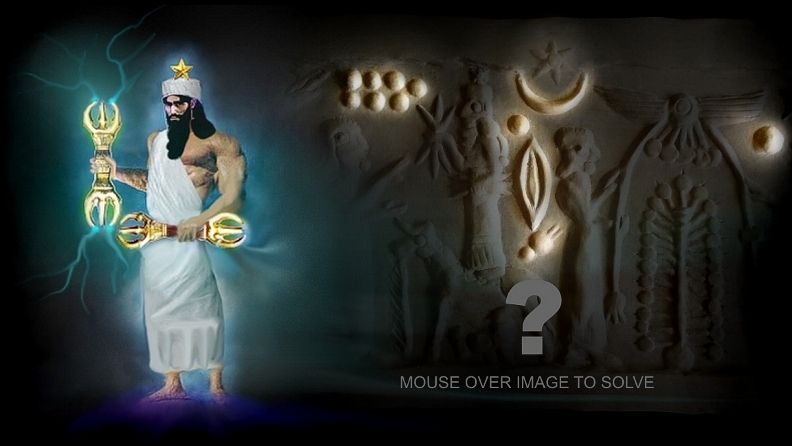 Mouse over the image to compare Gilgamesh in context with the Bull of Taurus. This depiction above now stands as the clearest and oldest evidence ever of Orion with Taurus. Also a breakthrough dual teaching the way it decodes an 'anomaly' radiating light on the back of the cosmic Bull. 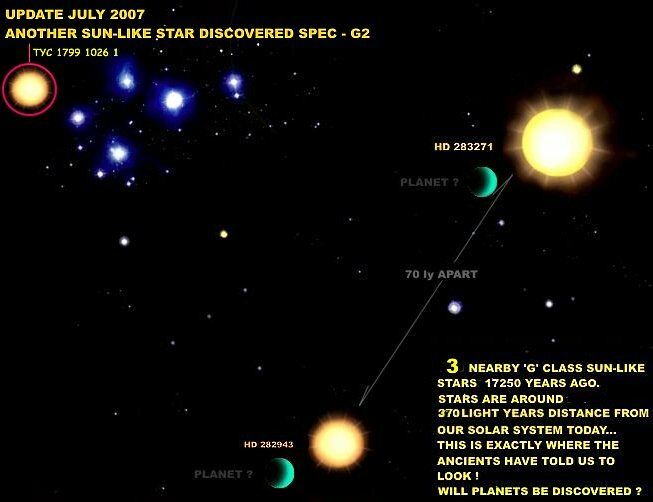 In the dual representation of the two orbs with one in crescent I proposed in my book in 2003 it was one celsetial body in front of the other, creating the usual Sumerian style of what I also proposed was a Sun star and its exoplanet world in crescent. It cannot be the moon as the moon cannot achieve a sickel shape crescent. This is the effect when one is in eclipse position with the other. The celestial depiction of a sacred place in the heavens where Gilgamesh originates from is identified in the small cartouche shape object on the back of the cosmic Bull. This is where the Pleiades is positioned. Ponder on why it was shown like this. The supporting evidence of an obsession with the Pleiades is the repetitions of the theme numbering in the hundreds seen lower down on this article. They are found on the earliest Sumerian scroll seals in museums all over the world. Here is an article that identifies how DaVinci encoded Vitruvian Man as Orion with Orion's Belt and nobody saw it ref . It also includes an alien identified as a 'Grey' present in one of his paintings at the birth of The Christ. ref . But it is Gilgamesh that is the dual overlay connection as he links the two teaching depictions. 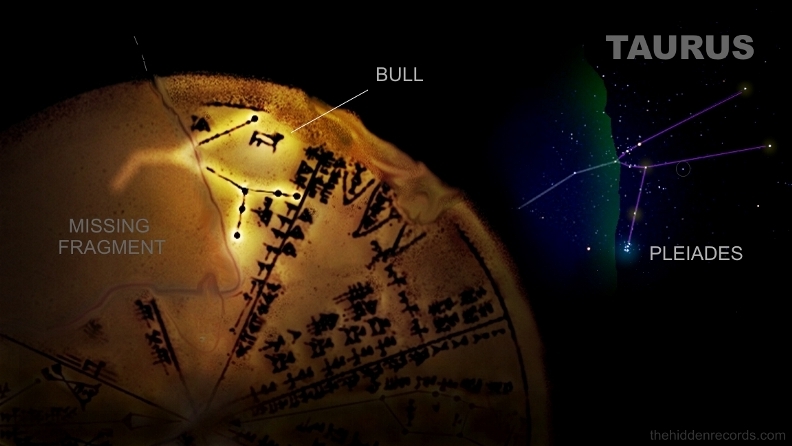 The object on the back of the cosmic bull is the highlighted area and zoomed in so to speak and is placed over Gilgamesh and the zoomed in Pleiades next to him. Mouse over the image below to see how Vitruvian man fits in and the message extracted decoding this is who we are and where we come from, which is in the zoomed in area found behind the back of the cosmic bull. THE MISSING CELESTIAL SHIP... DECODED? 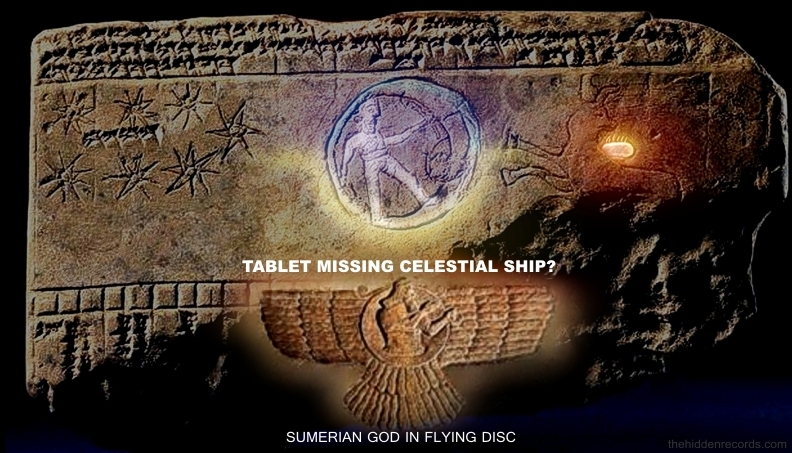 As seen in the Sumerian seals around the world when I first discovered the amazing tablet I thought to myself that it was a pity the celestial ship depiction was not a part of this story as it was always found in the seals. It was only when I wrote my book and started explaining the illustrations that I realised the cosmic traversing ship was here in front of my eyes. The creator of the tablet realised the world in crescent and an above view of a real mechanical flying disc ship is of similar depiction. To reason this further I decided to render a more obvious graphic here. If you mouse over the image below you will see how one orb elongated makes a celestial flying disc a little clearer from a slight side view. 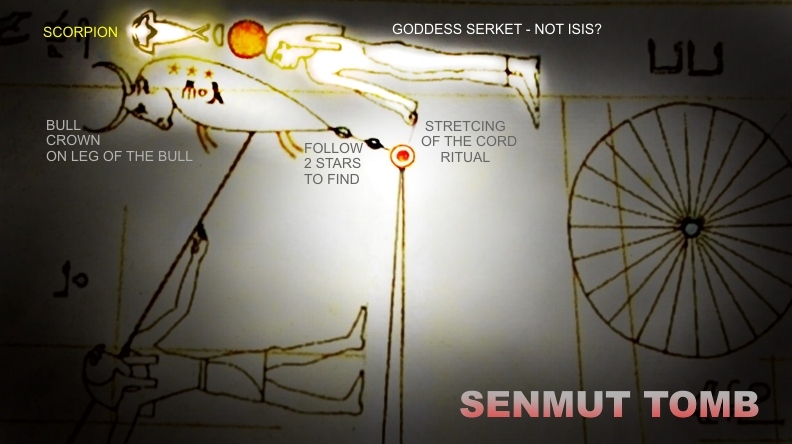 After all... is it not likely the Sumerian winged disc with occupant is precisely taught this way, as a disc that flies? THE MISSING COSMIC WORMHOLE... ALSO DECODED? 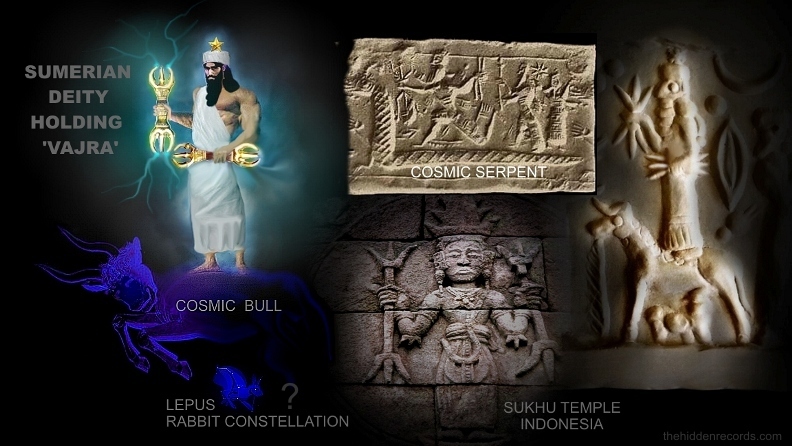 If one compares to the recent breakthroughs decoding wormholes in both Egypt and India where cosmic serpents are shown in the most revealing ways then one needs to see if the template fits Sumerian history as well. There is a dual interpretation possibility with the wormhole theory due to two common things these civilisations from different continents share. The Cosmic Serpent is common as a pathway with their 'gods' would be the first important clue. The second one is clear when you mouse over the image below. The stepping out the wormhole depiction is common with all. Call it a cosmic dance or a simple stepping through the gate but its quite a big possibility here. 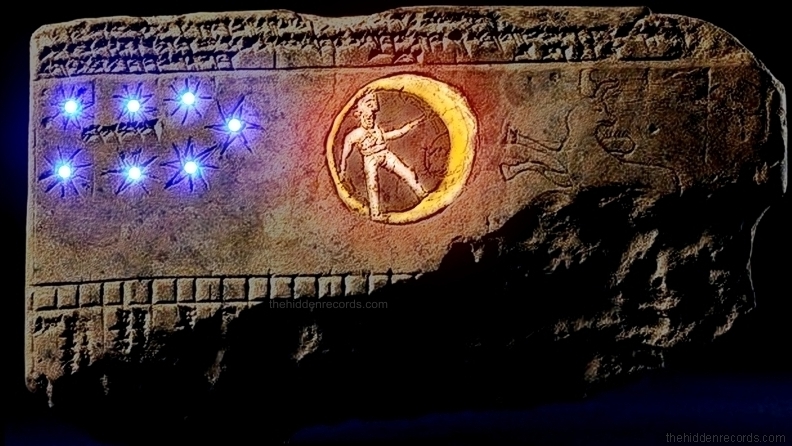 In summary: The two orbs with one partly in crescent is teaching of a sun star and its world but with the deity Gilgamesh as Orion superimposed on to it speaks wisdom in symbolism of either a cosmic wormhole trip to our world or the celestial ship itself... or both. The Egyptian Ouroborus papyrus with deity stepping out the star gate here with sun of origin in background with cosmic bull is compared to here which I have copies available for the public ref and the Hindu Shiva here with cosmic naga serpents and its Java Island Sukhu Temple Holy Grail massive breakthrough showing the same sun of origin in background like the Sumerian Sun orb here ref . 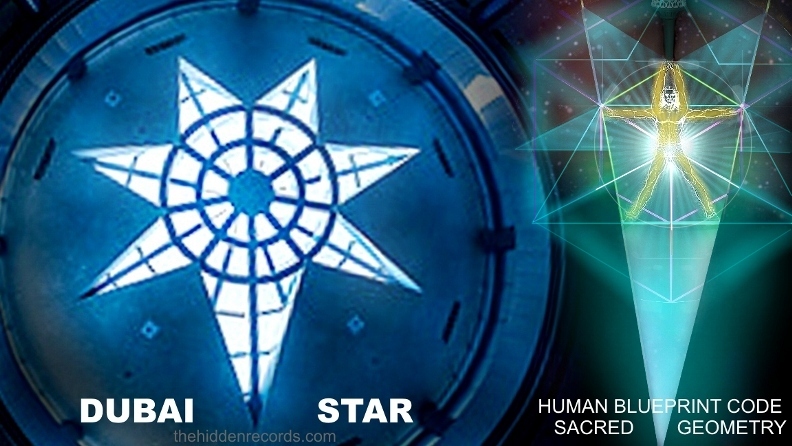 The Sukhu Temple star gate opening image with three suns behind the deity will be explored in a few moments that follows while comparing the device used in opening the star gates to the same detail on a Sumerian scroll seal. The Sumerian clay tablet has now been decoded. No other scholar or researcher has come even close on this. There is a little more that my Hungarian research colleague has added to this story. Márton Molnár-Göb realised there is a strange arc or halo shown on the Lion pelt. He recognised instantly after I identified the origin of the Lion insignia which I believe all monarchy systems on the Earth adapted for themselves from the beginning of time. It was a human genesis founding symbol of sorts. This I discovered in the monarchy star map that is derived from the unthinkable symbol on Mars ... the largest geoglyph in our solar system of a lion. ref . Márton said this tablet might have similar evidence of the Lion founding human civilisation and its Sun as it is a symbol only complete when including its Human origin sun system of what I propose was the earlier place of 'human evolution' origin sun star. Would it be so strange if we trully evolved from apes, but not here on Earth? Our ancestors evolved somewhere else then arrived and replaced another God created design code here that was in an earlier stage on Earth. I reference this extra sun star as Sol 2 in the bigger star map records showing 3 suns as a Solar trinity ref . It is here on the tablet as well. Look a little closer then see the full story of it on Mars and how and why it was covered up ref . This artifact I am fortunate to say has a museum quality replica made available to public that I have exclusive rights too at the moment, since no other has been commissioned. It will be on display at the Ancient Alien Artifact expos I am currently arranging for my next set of talks in different cities. If you want a copy of the piece then follow the link here . There are a wealth of Sumerian scroll seals in museums around the world. Before we look at the common depictions of some of the seals that show the star map secret, I want to open this part of the research topic with the greatest seal found so far. It is one that shows everything important in one grand depiction. 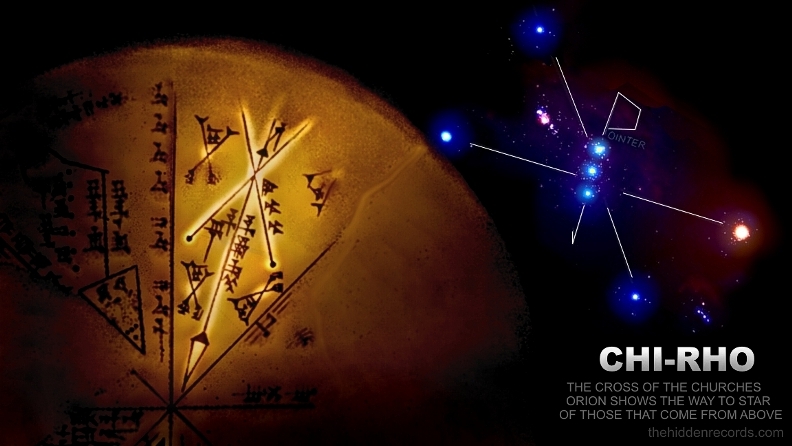 Gilgamesh as Orion standing on the bull neck area to show where he comes from uses Vajra devices like in Java where the Holy Grail resides ref to open what I believe is his stargate wormhole. It shows a solar system of origin near pleiades and a world with a comet. The comet theme by the way is also on the Inca Golden Tablet star map ref . This I believe is a timing marker of when the star visitors return one day soon when the greatest visual comet event occurs in a way like never before. 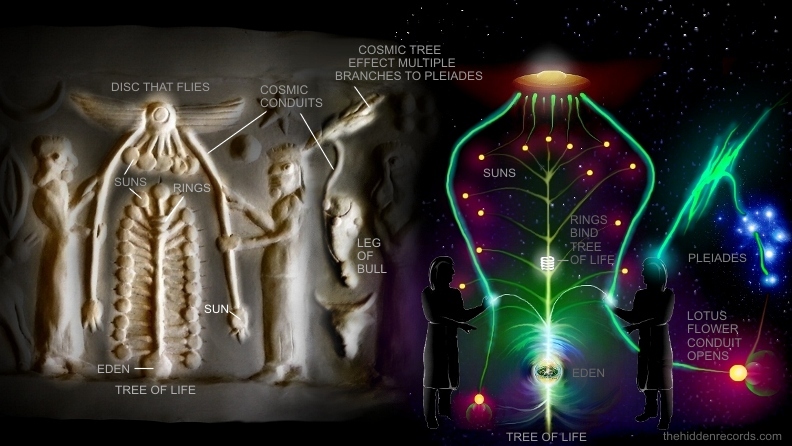 It shows The Tree of Life Creation interaction with its winged celestial ship. Cosmic streamers controlled by beings... plasma ribbons are all conduits for cosmic travel. Here is what I believe it shows artistically. Check the seal after it to compare. STORY RELEASE 2014: The ultimate scroll seal below is about to speak its secret here explaining all seen in the above image. 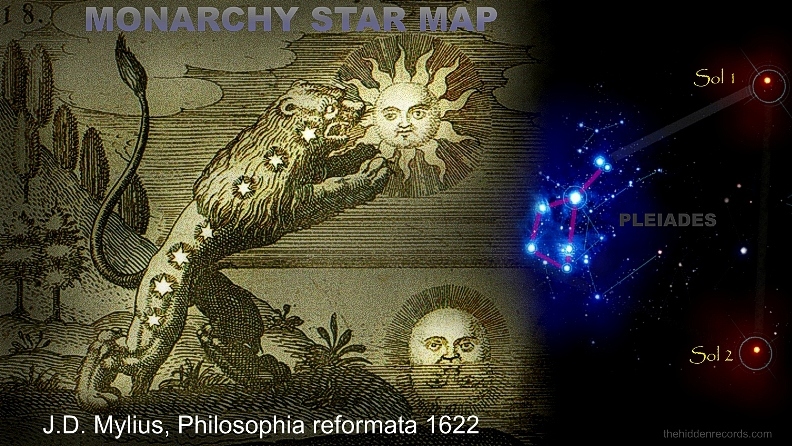 Hungarian researcher Márton Molnár-Göb found this seal and he immediately recognised not just Pleiades theme but a deity standing on a bull and a separate bulls head is obviously of paramount importance supporting the star map hypothesis. Sumerian Scroll seals are stone cylinder seals that roll over clay/wax to imprint a seal on a papyrus scroll. (See lower down in this article). This very large 35cm 'new' museum quality scroll seal print, now available to collectors shown below, ref is currently one of only two prints on show in the world. The original tiny 7cm print together with the real 4500 year or older ancient artifact is currently housed in the Louvre Museum in Paris. 4) Sun star with 6 rays. In the image below we begin with the left portion of the seal print. A bulls head in Sumerian history is a celestial bull worship symbol and this is not in doubt and I propose it is the Taurus star area. What is in doubt is the scholars belief the strange detail above the bulls head is just a gazelle and since it is with bull and standing on its head it is a mysterious celestial representation. If one looks at the museum print AO 22347 and click to zoom it is shown double in the print. The 'tail' touches the strange branch anomaly that touches the head of a being as well (out of the picture, see complete image rolled out later). I will go into detail later as we identify the green detail is part of a cosmic conduit wormhole map of the path of the star travelling 'gods'. The leg of the bull obsession was global knowledge it seems. Right through as the symbol being used to begin many great cities as a ground template carrying the legend "As Above ... So Below" starting with Jerusalem ref . I realised something obvious and how this star map secret evolved from one society to another so they could provoke war against those that have different belief and not 'chosen ones'. Each wanted to have their own way to teach it and each tried to make it look different to the other. 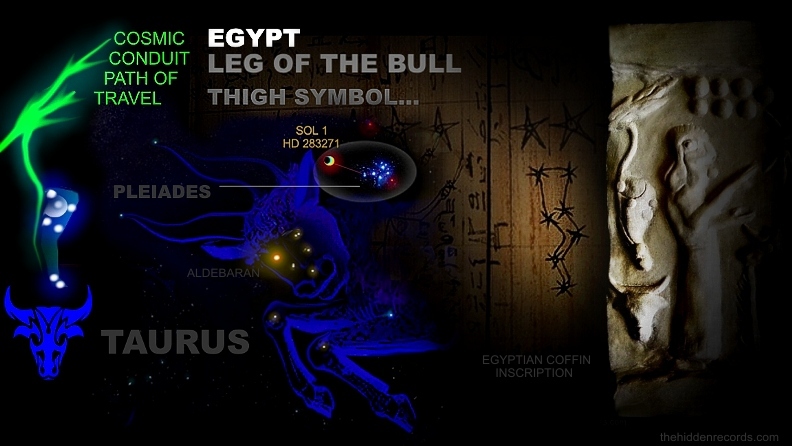 Since Egypt used the leg in clarity, it seems the Sumerians depict it, perhaps encoded strangely like a gazelle 'foetus', tail facing upward, tucked legs and head facing downward. In the image below scholars call him a thunder god like Zeus, yes no problem with that as I believe Zeus is this very identity as celebrated by the Romans. But I believe the Sumerians identify this deity something other than what scholars suggest. I agree with Márton Molnár-Göb of Hungary that the Bull is part of his identity that he is one that upholds the Taurus star map teaching and of the highest rank. We have believed this to be Gilgamesh himself... one personified also with the stars Orion as the human code teaching showing the way. 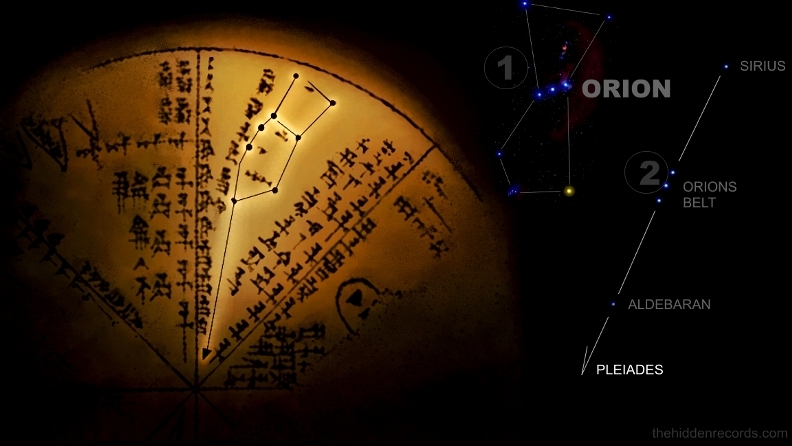 I found two strong pieces of evidence in the image below how we can verify this is Gilgamesh as Orion and it is repeated in the Sumerian Tablet that follows. Yes as in typical Sumerian veneration standing on the back of the bull is royalty but he is standing there because thats the part of Taurus where the stars of the gods reside. The Pleiades is found behind the head above the back of the bull. 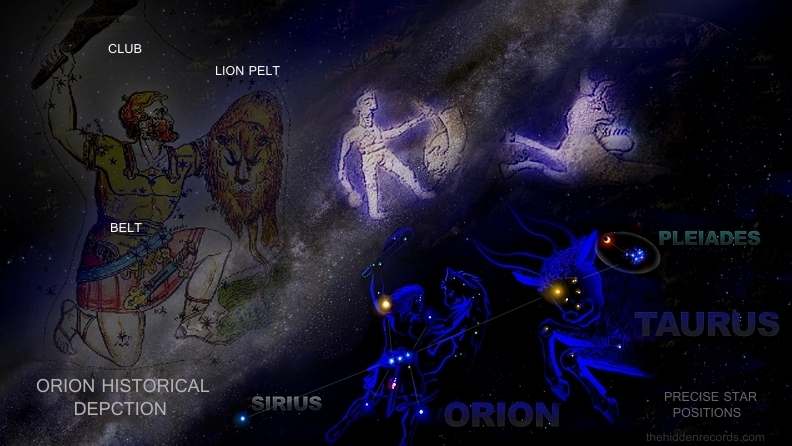 This small piece of the puzzle places the rabbit correctly depicted if Gilgamesh is personification of Orion that uses his belt stars to show the way to the Pleiades area. I compare Gilgamesh in another scroll seal where he rides a dragon serpent I propose as cosmic conduit wormhole holding the same trident Vajras. Here is a vajra in the British Museum where it is argued if its Asian or other in origin. ref . I am considering ordering museum quality duplications of this item for the pubic if there is enough interest. (If interested please write to me in the contacts link). BUT WHAT DO THE TRIDENT FORKS DO? 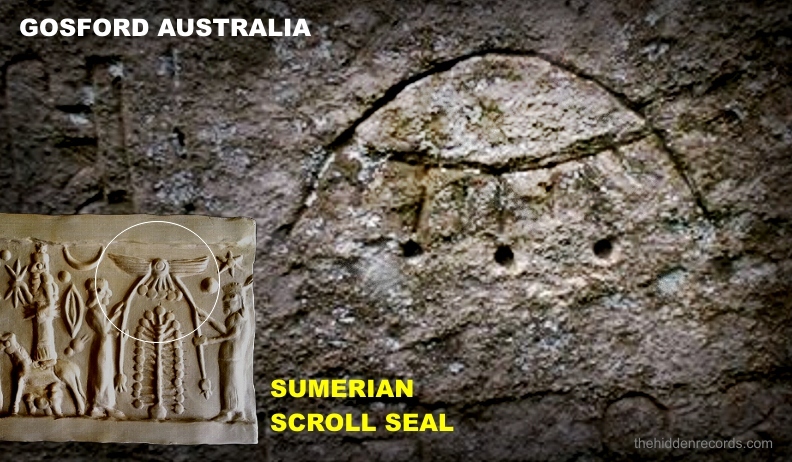 Moving more to the right decoding this scroll seal piece by piece from left to right we see a very strange shape below a crescent between orbs as highlighted. One orb below the strange shape has two extra lines added to it. I believe a full Solar Trinity layout is depicted above the strange curved symbol with our Sun having the two lines with Earth. Mouse-over the image to see the full interpretation. I am certain the curved symbol is the Vesica Pisces secret of Christianity, the shape created where two circles are scribed to overlap ref . Not much is spoken about this symbol due to it being considered forbidden knowledge. I propose the Trident forks called Vajra create the opening of the cosmic conduit wormhole star gate so to speak and it is shown this shape to show where it opens from. Yes this is a complex story and yes the ancients found all sorts of ways to encode it and even demonise it to keep commoner away saying these teachings are the devil and if one is caught with such manuscrips they will be burned on a stake as a heretic. Time has come to measure this all and using reasoning and logic to see what is really hidden. I want to debate if the reason our sun is placed beneath the opened sacred conduit of the star visitors seen above with our Sun system as destination, did they record a time marker with this double line as the time of a large comet encounter or... is it the star gate opening symbol pattern of a lotus flower as seen to the right of this detail at the bottom of the serpent ropes as seen in the next image below. The final detail on the scroll seal is the Tree of Life and disc that flies seen below. This is a subject matter I claim to speak from experience accurately because I believe I have been to this place where a Cosmic Tree of Life light nucleus of the universe resides. It is home of the soul and Creation place of all matter and life that should really be classified as "God" The Creator which I call "Creation". No... no european man in a golden throne as one regional holy book account for europeans needs you to believe. The Creation is light with many plasma ribbons streaming from it, a place that every soul originates from. A very deep loving experience feeling like home that is everywhere omnipotent eternal all forgiving all loving all seeing light and a part of you yourself. I had a near death experience and document on the website oneism.org that I was allowed to come back with more than I left with. A life quest or pledge where I felt an emotional sense of responsibility to bring evidence of it forward with this research I call The Hidden Records, the name given to this free view website and my book for those that can afford books ref . 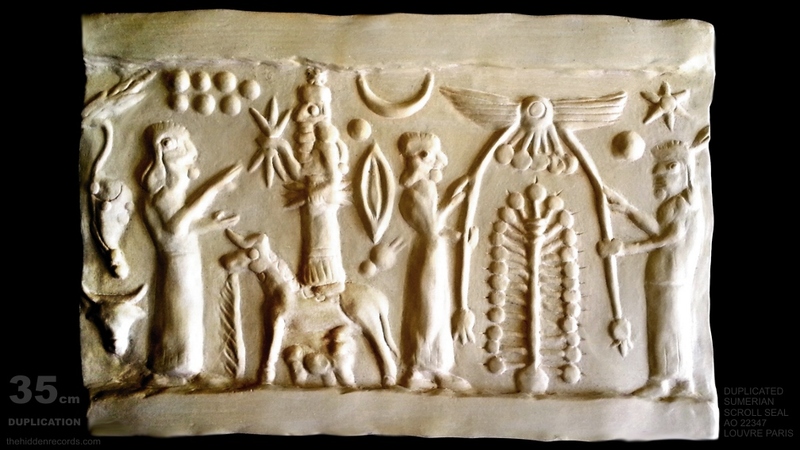 The depiction below is the Sumerian style depicting the place of all souls and Creation. The orb at the bottom of it is the biosphere built around it where this ligh anomaly is bound by rings buy the first life to find home a long time ago. The seal shows both rings and the Eden orb. It also connects to all stars and here denoting many Sun systems for planets and life as we know it. In the image above there are two deities nurturing the Tree of Life. Interacting with it teaching that there are people like us that watch over the Tree of all Life and can not only interact with it, they can use the cosmic streamers of plasma as wormholes and traverse space to reach all the sun systems. The two 'serpent ropes' each interact with is a teaching found in Vatican records and other teachings around the world which will be added here to debate in Part 2 that follows. For now you the reader if you have read this article and seen the links and if having some background on my star map theory or the Tree of life story you can now look at the image at the top of the page and know what is going on. I will add more shortly with part 2 but for now this is the intro to the Sumerian Seal that I have made museum quality copies of for the public. I cover the general detail here in the video. But before closing part one, a few days before the Mars comet event, ponder on the possibility this is a message identically matching the Inca Golden tablet pleiades and comet story ref ... and the arrival prediction I cover that seems due any moment soon in the study of all prophecies here ref . I claim the Pleiades, special star, flying disc and crescent were an obsession… are there more? Here are just a few examples. Some show more than others. Compare these star patterns now with Egypt, Stonehenge… even that on Mars, and ponder on the possibilities of it all being a crazy religion and that all the ancients across the world lied claiming making the contact with visitors from the heavens. They all built pyramids or large monuments… they all worshiped star visitors from the Pleiades that looked like themselves, but they were so advanced that they were deemed ‘gods’. All these ancient civilisations also interpreted the Tree of Life as another important secret that later was almost completely forgotten. This is all up for viewing at oneism.org . The famous Nineveh disc seen below is over 2500 years old and scholars agree it is a copy of something stone carved that was very sacred since it is a 'rough' rendering in clay. I have recently aquired exclusivity to the first high detail replica of this piece found in the British Museum ref The Nineveh disc or planisphere has recently been revived in public as a very popular artifact on new TV documentaries as filmmakers got the green light for thier work, when all chose to turn the interpretation into absolute ridiculous fiction. The trend seems to be by the powers that be to turn anything important in history on the Pleiades into chaos. They all chose to interpret the Sumerian text on the tablet that was undeniably verbatim defining a being with the name ENLIL ref riding a winged disc as something unthinkable. Before defining their fictional cover up claim you need to realise another ethic stipulated in general academia. 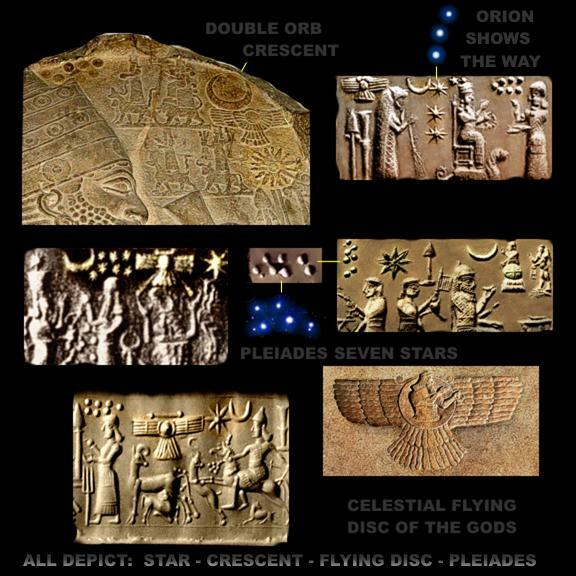 They insist all the Sumerian depictions of a winged disc, teaching of a disc that flies with beings not of the earth shown as occupants are an ancient cult that all ancient civilisations coincidently lied about. Therefore Hollywood has chosen to ride this ethic for thier cover up twist turning the flying entity into... a meteor. FAMOUS AUTHOR MANIPULATED? The late very famous author in the field of ancient aliens Zecheria Sitchen ref also did something similar matching what I believe is on the same grounds of my manipulated media conspiracy theory. Sitchen was either part of a cover up conspiracy about critical detail in his Sumerian presentations or his publisher had the same 'special conditions' like some of the big media have to create chaos on something scholars had already proven was... the Pleiades! 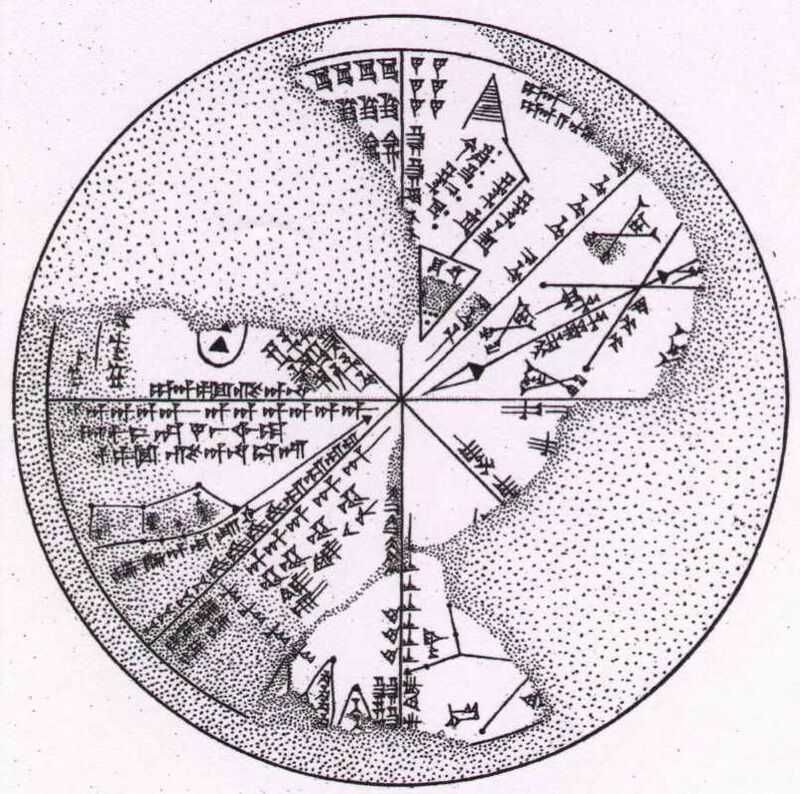 Sitchen first surprised thousands of readers and especially scholars in his earlier books when he decided to interpret the most common cluster of seven stars as seen in the scroll seals above calling them seven planets. This 'error' is where hollywood have chosen to to twist Sitchens incorrect planets claim one step further. Having a meteor in place of the flying disc on a journey to a forbidden destination would be easy to claim that it was seen in context passing the planets on the ecliptic and the other constellations shown. Sitchen was one of the first to offer a genuine breakthrough in the ancient alien hypothesis agreeing with most authors today in this field that the winged disc of this entity ENLIL was a being riding inside a disc that flies through space. In one of his last and most recent books before he died, "The Lost book of Enki" he made a lot of ground in credibility of the interpretation of flesh and blood 'gods' like ENLIL flying in celestial ships through space. 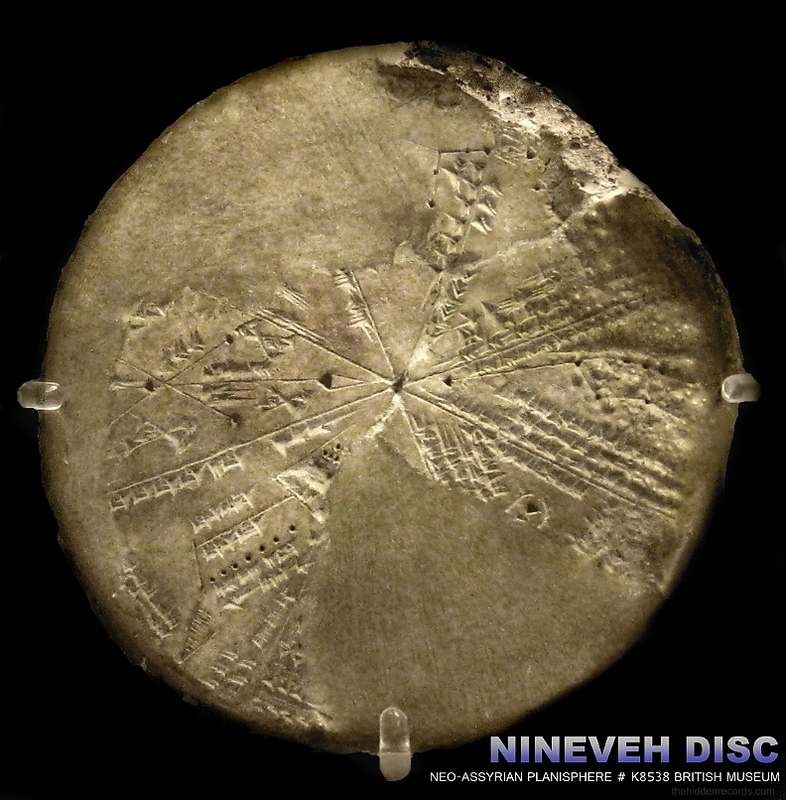 But where did the disk fly to according to this Nineveh disc planispher artifact? 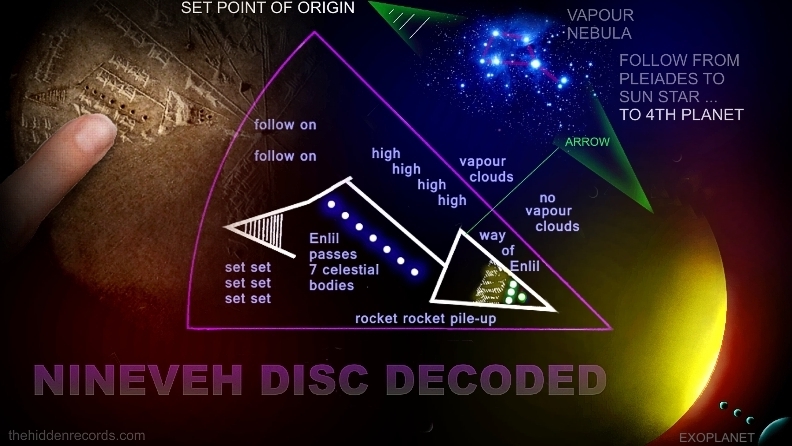 The constellations coincidently to date seen on the disc are all in chaos presented by other authors scholars and TV documentaries and it is time to study the obvious evidence in decoding the disc completely. 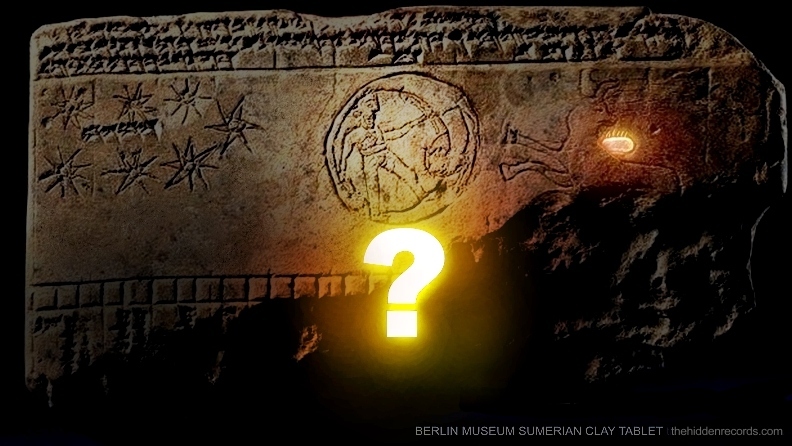 The biggest blunder that TV shows are running have claimed like scholars to insist the entity ENLIL ref riding the disc that flies seen in hundreds of other depictions like the previous Gilgamesh Tablet overlay image earlier, to insist the ENLIL must be a meteor. How ridiculous is this? In the image below see the text where Sitchen and scholars have deciphered the cuneform text that narrates what is happening in the pictogram map. Firstly it is the seven celestial bodies that hundreds of cases to date scholars all agree upon is the Pleiades. But what follows is where they all either run for the woods and leave the disc alone or blatently fabricate a new lie to suit the media interests. The image above shows twice written in stone so to speak ENLIL ref a being is spoken about and has absolutely nothing to do with the name of a meteor! If it were a meteor it would be given another unique name and have nothing to do with ENLIL at all! 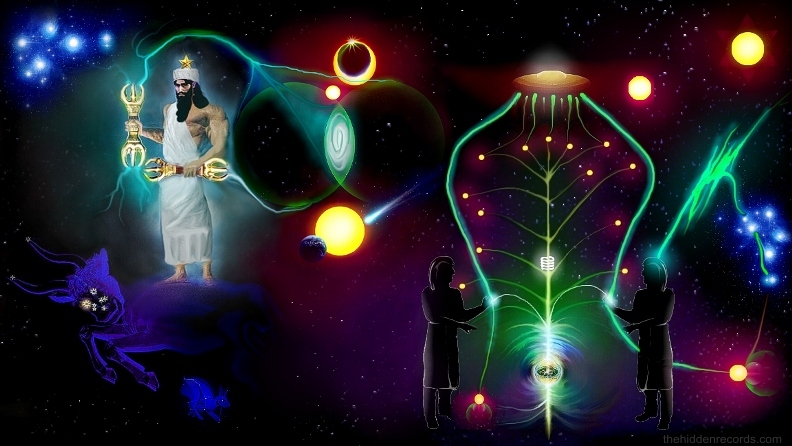 The depiction here I have found clearly defines the journey of ENLIL from a place of origin which is Earth on his way to his home realm, and exoplanet near a Sun star passing the Pleiades as a cross reference point! Yes... the nebula clouds in astronomy could be correctly called vapour clouds by definition because the main components of this 'dust' is Hydrogen and oxygen, when combined are simply... water 'vapour'. Or it is the Solar Trinity and one planet there but to me it seems less likely as most depictions previously seen obsess mainly with the sun star designated Sol 1 Primary in the starmap analysis page ref . The next segment highlighted on the Nineveh disc below identifies Orion. I believe it uses the Chi-Rho symbol ref that I proposed in 2003 represents Orion as the cross of the churches ref and the teaching here I also identified in the Christ story which was revived by Emperor Constantine. 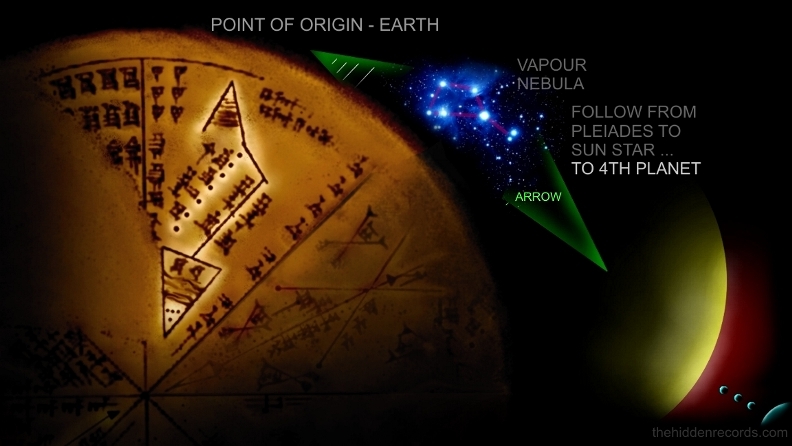 It is as simple as the image shows... follow follow follow as the Sumerian text repeats Orion's Belt with the letter P as in Latin as punctum which also means 'pointer' often depicted in earliest renditions with an arrow head adaptation. Note how the arrow points to the centre of the disc. 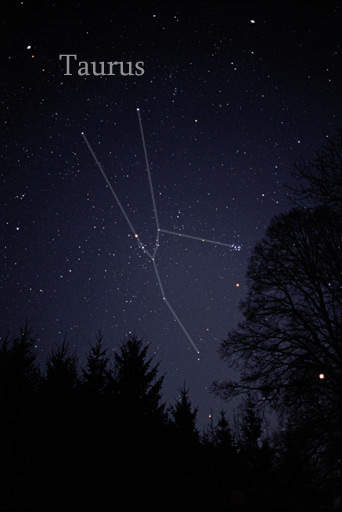 This next segment below is another Orion teaching showing it as a star constellation. But here the scribe either got a little over excited in the clay duplication of the original tablet because he already inscribed the constellation but seemed to extract Orion's Belt sideways to emphasize in a repeating theme here showing Orion's Belt is what one follows is the sacred teaching. I add a second sketch to show what I believe the scribe was trying to teach as one follows through other stars in reference now heading from Sirius through Orion's Belt past Aldebaran to ... Pleiades. The Pleiades then would be the destination near the centre of the disc. The fourth segment had me lost for many years. I could not decipher it because most of the segment is missing. The museum artifact has repaired blank pieces filled in when they repaired the artifact. Only recently I realised when looking at the scholars source image reproduction ref there was a small animal symbol there with the missing constellation reference. It looked pretty close to a bull. Then I realised we have two Orion depictions, one with stars and one with symbols with two segments and only one Pleiades theme segment. We need two Taurus themes to match the two Orion themes to complete it. What was missing was a Taurus constellation depiction ref . It was true and it was a match. Not just Taurus matching the tiny bull symbol but there is another design pattern unfolding. It had Pleiades position facing the centre of the disc! I had another breakthrough here and proving the star and message interpretation I offer here for the first time in public in much greater detail since my more simple general theory version in my book. The disc is without doubt hemispherical in its design and the segments all cross at the same 'destination' at the center of the disc. Something profound that dwells in the pleiades area! 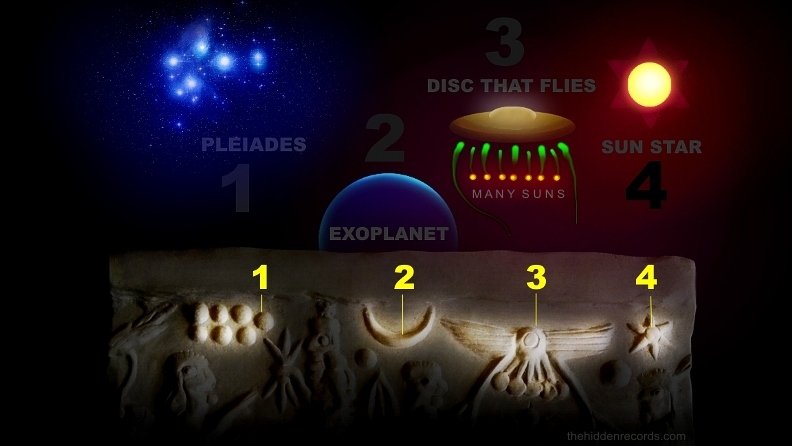 This was the sacred place of the 'gods', the place, and exoplanet place of origin of our human ancestors and the disc is an explanation device showing in many different teaching mechanisms how to get there. Two segments of the disc using Taurus and two using Orion as 'way showers' to the ultimate destination... the sun star and exoplanet of ENLIL and Gilgamesh seen in the Gilgamesh Tablet! Mouse over the image below to see the centre of the artifact is the destination area of the hemisphere design of the disc. Also compare what you have reasoned so far from the original artifact to the illuminated symbols you have now seen. A high detail reproduction of the artifact now available to the public. (All other copies available today by reproduction companies dont have sharp detail match). Here is the link ref . The cradle of civilisation is often spoken about at a place called Sumer in Mesopotamia, well over 4700 years ago which became Babylon in the area of Iraq today ref . The Sumerians that founded the site seen below is the biblical Babylon which originates from the word ‘Babilani’ in Akkadian’ which means ‘gateway of the ‘gods’. This is another clue here since they aligned stone gates for viewing the important stars here as they rise in the east on special days. ‘Babel’ or ‘Babylon’ is supposed to represent ‘the place where ‘god’ came down to Earth ref’ - Genesis 11:1-9. Taken literally this suggests a visitation event… contact. In Mexico the largest ancient city of the Maya that the Spaniards conquered was given the identical name but historians think it is just a coincidence. Sumer was situated within the Mesopotamian plain, now Iraq - between the Tigris and Euphrates Rivers in Bagdad. What we see in the image below are the ruins of Babylon today after Saddam Hussein rebuilt the three original ziggurat pyramids which are located almost in an equilateral triangle layout position. Saddam placed his palace on top of the mound he believed was sacred. I have proposed here that Babylon is another star map of the three Sun-like stars near the Pleiades that is associated with their history of so called 'Sun gods'. The ancients built one zigurat they called the Tower of Babel ref . For me, learning that the tower of Babel was once close to where Saddam built his palace I realise the Sun marker Sol 3 in the trinity was deemed more important to him and perhaps the Sumerians. There already are global media claims on discovery of a "New Babylon" correlation to prophecy according to many reports referenced here. Sadly it appears to fit the mark not only to verbal description of prophecy but the proof of the pudding is how I propose it matches old Babylon astronomically like a mirror reflection. UPDATE...MARCH 2015 STATEMENT: This is a big story that follows, but for now it will be short and precise and I officially called this correlation for now (as it is still partly under construction) just a coincidence since it also involves very controversial and sensitive references that have already claimed it as "New Babylon" throughout the world. Dubai is a city built from slavery (see references that follow). Prophecy in the Book of Revelation speaks of a modern future world super city status reference as "Babylon", a "new city" of the future that would obviously have the world's richest most powerful people live there. As prophecy goes, claims made today already enslaving the poor ref 1... ref 2... ref 3... ref 4 and women for their pleasures. ref 1... ref 2 People living like they did in old Babylon with its elite hanging garden city ref, a place more historically known above all others... for prostitution ref. Dubai if it is the 'New Babylon', is a city that has been built with the tallest building in the world listed as the 'Tower' of the Burj Khalifa ref . The use of the word tower should be a clue here as it is placed importantly and symbolically with what I propose is Sol 3 in the correlation theory with the round land marks I have identified all of the same size. Sol 1 interpretation almost a defiant 'empty lake', Sol 2 currently being developed so we wait and see. The same three suns identical to historical Babylon in postion near Sol 3 (mouse over). 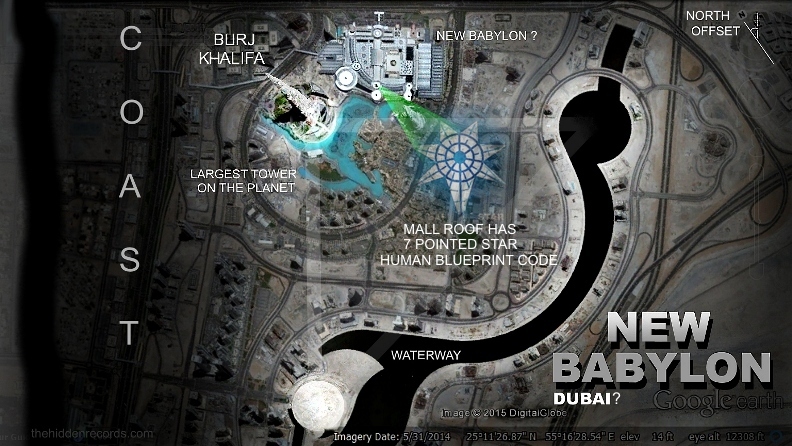 1) Sol 3 position with Khalifa tower seems important and it is near the same area in Old babylon where the Tower of Babel was situated. 2) It is the same correlation choice Saddam Hussein made to locate his palace in the Historical Babylon site in Iraq. 3) Both Old and New babylon are idential orientation even to the aspect of sligtly deviated anticlockwise angles from true north. 4) Historical Babylon has its thigh shape city postioned next to Sol 3 where I propose Pleiades correlation and the New Babylon site has the largest Mall on the planet. 5) Both use waterways in simila cosmic serpent symbolism fashion. 6) New Babylon has a Tau 'T' on its largest Mall symbol for Taurus as seen at Gobekli Tepe and many other ancient sites with Bull worship. 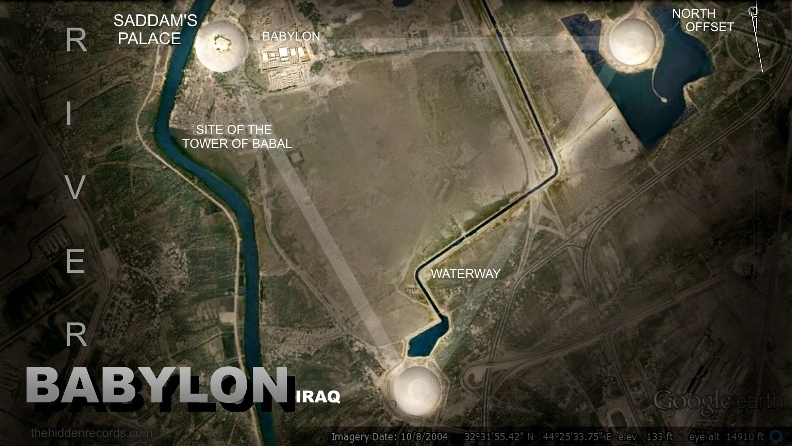 7) Both sites have major natural waterways on the left side, Euphrates River of Babylon, the Coast line of New Babylon. ... one that has the largest mall in the world... the largest frequented city by the rich.. one build controversially exploiting labour like slaves. It is one that some say has the largest women enslaved there for the interests of men. All very controversial. Important in reference to prophecy. These extreme claims will all be referenced as they are made by others. I only bring clarity to it as a mirror of the old Babylon star template. This city proposed as the New Babylon is no mystery... excuse the pun. The city today seen as the worlds playground of the elite ... Dubai. One of the things that becons one to interpret the top of the roof of the Mall of Dubai as a star map of the Pleiades and placement of the star Alcyone is the placement of a sacred seven pointed star of a style as seen in Freemasonry ref but this one is made to be viewed from inside the Mall looking towards the sky. One that includes the human blueprint sacred creation code that I had found in 4 of the star maps, Mars , Stonehenge , Egypt and Rosslyn . Mouse-over and compare geometry lines and similar style of the sacred star to Stonehenge. Prophecy of The Book of Revelation ref speaks of the world in the future near the 'end times' ruled by a most powerful destructive female figurehead. One referenced as a Queen and one has to wonder. Well, the way our world works, it would most likely need to be the richest woman in the world since those of greatest wealth seem to be the powers that be on the planet. Let this be an important clue. The biblical prophecy claims it is this woman who has hidden many sacred truths that would lead to peace and it is she who manipulates humanity and provokes a terrible war to enslave the world, promoting 'the mark of the Beast' where people are branded/tattoed with bar codes like goods in a market and with implants ref that is emmersed in lies and chaos. Márton Molnár-Göb of Hungary made a stunning finding in an old codex depicting the Whore of Babylon and it had a secret encoded symbol pictogram. Here is his website cracking this amazing cipher puzzle code ref . You will see how it is similar to the Hebrew Solomon Key cipher puzzle code ref . 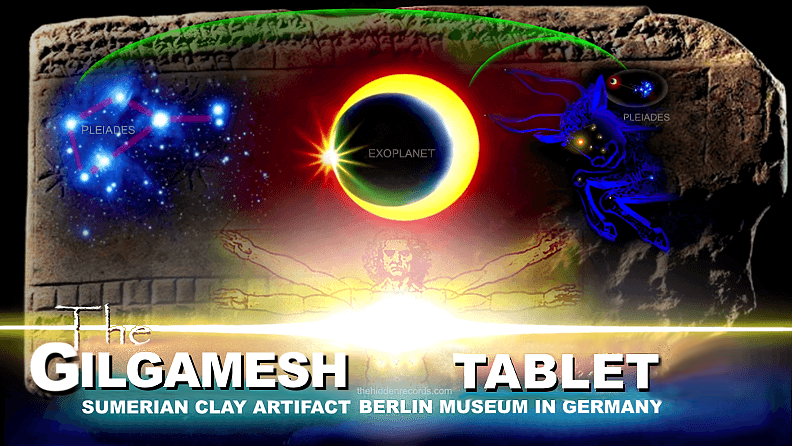 His article takes this codex deeper and shows how it connects to other depictions there of the Pleiades, cosmic serpent wormholes in Christianity and more on the Solar Trinity ref . In the codex page copy below there are two star theme symbol codes to decipher. One of the swirls and seven pointed star... one of the star pentacles that are different in radient rays suggesting catagorisation if it were a secret map. Márton and I have found in ancient depictions these swirls are interpreted as stars and the pentacles as sun-like stars. 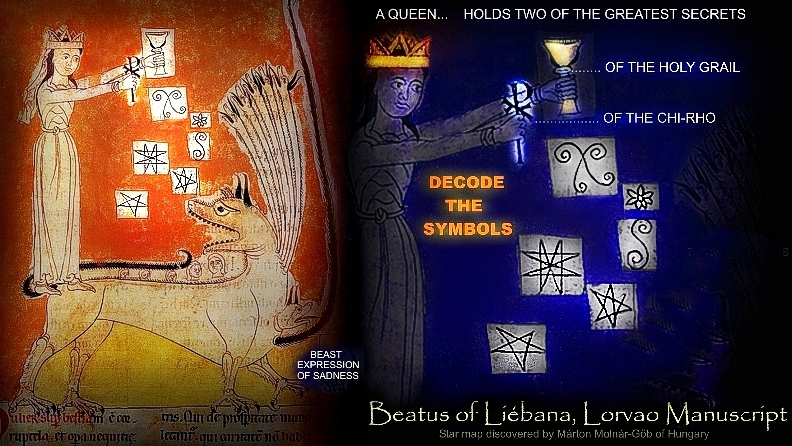 Márton saw the symbols and cracked the codex puzzle... it reveals the Pleiades star map and more. I believe it also claims a clear statement, that it is a global powerful future queen with a crown who is in power in the future who has hidden both the secret of the Grail star map truth ref and the Symbol of the "XP" Christ symbol for Orion that shows the way to the star map ref . The Book of Revelation mentions royalty and a queen with details of the Whore of Babylon and the biblical reference to review the texts in modern and old texts are here ref . The whore is dealt with after Armageddon and a terrible Earthquake. The image here and the texts claim it is a powerful historically established Monarchy who have hidden these two truths from humanity... including the sacred pure cosmic serpent dragon that connects to God Creation ref that sadly stares at the tyrant woman in fear and dismay. 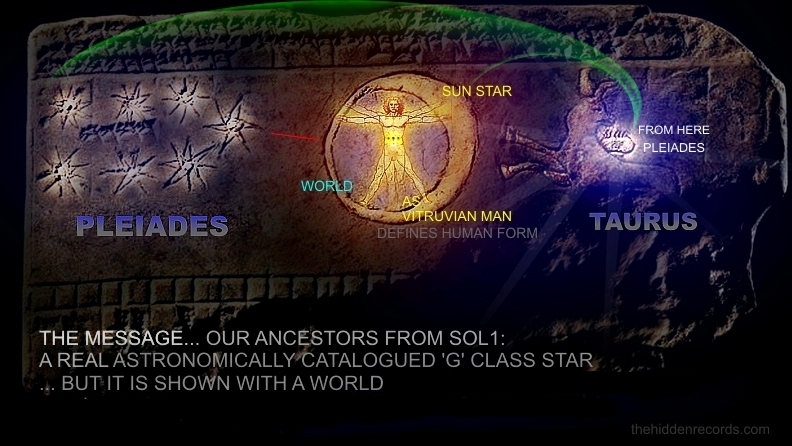 The star map of human origins from the 3 Suns near the Pleiades is what she has hidden suggested in this codex page. The fact is... the Grail ... the Chi-Rho and the star map are three encoded versions of ... the human origin star map! She might be a destructive Monarch trillionaire but the 'beast' title is far from truth... it is a sacred part of God Creation that was obviously demonised by historical monarchy who controlled editions of the Biblical works since its first publication. Is this tyrant sometime in far future or is it soon? I wondered since it is a young beautiful woman with long black hair depicted that it must be sometime in the future. Then I wondered why the crown had a veil, like a bride would wear. Since it is prophectic codex and portrayed to give clues I wondered if it suggests St. John had a specific vision of the time the moment a queen is empowered and takes the secracy oath. Consider the possibility the end times are on our doorstep. Are there any other clues the monarchy have hidden the secrets the Revelation image has just offered? the answer is yes... there actually is a Monarchy theme star map to compare this with. While exploring the leader of future Babylon I felt its worth adding this new finding here when dealing with who might inherit power over the planet. The secret legend of the green lion, where on earth does that story originate? Since it was something secret, very few media or books or articles have been published to expose it. I first came across it while searching for the symbol of the monarchy of Europe. Its no mystery ... its a lion. ref . Reasoned as head of the food chain, one of a predator , and symbolism in human ways... a dictator. Then in searching further I saw the green lion symbol which had no clear answers. Before showing you the variations of the green lion I need to reason why it is green because this is where the reasoning of it elevates it to a status much higher than any monarch of any country. We need to look back into the hidden records of the Egyptian papyrus I discovered that had a UFO arrival genesis theme ref because it shows personification of the highest of high mortal on the planet in ancient Egypt. He was Geb and he is shown painted green perhaps to represent simply the green Earth personified. ref . In essence the green lion depicts the head power of the world as a monarch. Are there any cases of the green lion showing a Monarchy connection? Yes there is. There is one where the lion is crowned with the symbol of a monarch with globus cruciger, a secret encoded monarchy globe and cross, one established as a Pleiades star map in its history too ref . 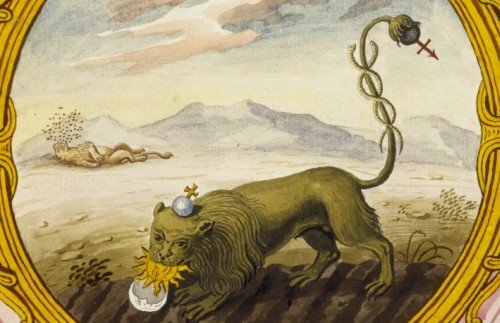 There are a few sacred historical Europe sourced alchemy manuscripts with variations of the green lion secret. The oldest and clearest example of all the cases studied is the image below of a sacred 1622 manuscript called Philosophia reformata by J.D. Mylius ref who was most likely a Rosicrucian order as he has expressed knowledge of the Rosicrucian Pleiades star map ref . Mouse-over this image below to see the star map alignment within the belly of the Monarchy lion. The depiction above speaks volumes. It is writen as a green lion but depicted in sketch here as it has already consumed seven stars. They are positioned in a row aligning with a sun in the process of it devouring this sun. But it is not our sun... it is one near the Pleiades as in all other 35 top cases so far and it has a second sun depicted as well. The human face personification depictions are symbols for Sun systems of human life origins... Sol 1 and sol 2. It is the Monarchy who have hidden the secrets of the Pleiades human origin star maps. Another green lion depiction reference here, with flock of doves in the shape of the leg of the bull for Pleiades has two wormholes on its tail in another article with research on it ref . In typical Christian symbolism the flock of doves is the representation for the Pleiades found in the Rosslyn Chapel ref . 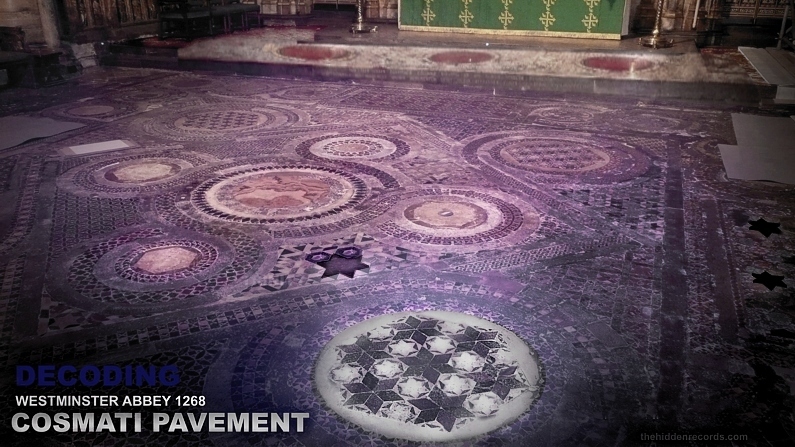 Westminster Abbey has a very famous tile floor called the Cosmati Pavement ref. It encapsulates according to this ref link what the experts say is a mysterious cosmic theme and a Latin inscription speaking of a time of the end of the world in reference to the star map. Most scholars recognise the Pleiades as a cluster of seven yet choose to remain tight lipped why. Royal occasions occur here and Kate and William stood here taking their vows. Right in front of Sol 1, the primary sun star in front of the altar ref. 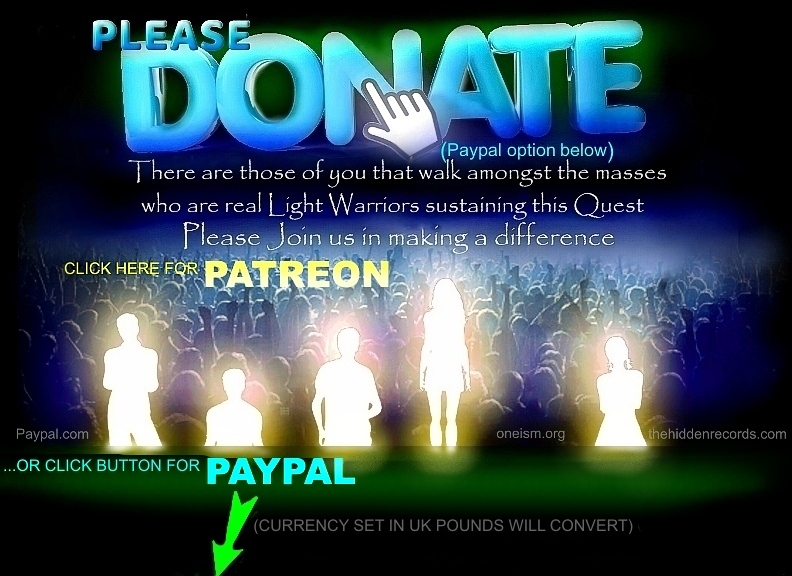 Coincidence the center sol is the European tradition Templar favourite too ref . The star interpretation is closer to the Hebrew Solomon key depiction ref and has a general choice of 6 pointed stars of Hebrew tradition. A solar trinity of 3 matching size 6 pointed stars where Sol 1 primary is aligned with Orion and Pleiades and it seems to be depicted with TWO PAIRS of exoplanets! 4 exoplanets like the Solomon Key cipher and stonehenge. Two Solar Trinity themes here... one as a star map ... one on a ritual step by the altar. Lets for now call all this monarchy conspiracy just a theory and lets get back to the historical Babylon history research and move on. Maybe the New Babylon star map and prophecy claim is some hyped theory, but the historical account of Babylon is a lot more than just theory. In ancient Sumer the massive ancient Ziggurat pyramid temples of old Babylon once were said to be built ‘so they could reach the heavens’ which suggests their cosmic connection both in layout plan and inner pyramid spiritual ritual. These three large monuments most likely once represented their three most important Sun gods.